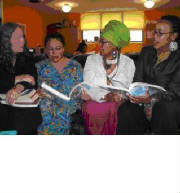 This is the home page of the International Center for Traditional Childbearing Midwifery Mentorship Program. We use this page to help us connect with our students and others interested in our programs, and to announce important events. ICTC is a organization dedicated to preventing maternal and infant mortality, and to preserving the traditional knowlege of midwives around the world. We hold a great debt to the Black Midwives of the Southern United States who worked for decades to safely bring babies into the world in spite of poverty and goverment persecution. Those wonderful wise women kept the profession of Midwifery alive, saving it for younger generations of women who are called to follow in their footsteps. ICTC continues their tradition of sharing knowlege by training new doulas and midwives through the Full Circle Doula and the Rights of Passage Midwifery Mentorship programs. ICTC also helps pregnant women stay healthy by teaching childbirth classes, nutrition, and well women care; and helps them connect with volunteer doulas, and prenatal services. The Fifth Annual Black Midwives and Healer’s Conference was recently held in Phoenix, Arizona on October 14 - 16, 2006. It was a wonderful opportunity to connect with midwives around the world. We’ll be posting some pictures here soon, but please follow the link at the bottom for more information, or jump to our sister website at www.blackmidwives.org. Also: please see the PNW website for more information, a discussion forum, and an INTERACTIVE calendar! This great calendar can be used to keep track of events and classes in the region. Anyone can post an event, and it's very easy to use. Best of all -- you can tell the calendar to send a reminder note to your email boxes so you won't forget important occasions and appointments! PS: You can also find more student handouts at the Midwifery Updates homepage. Read about the Fifth Annual Conference!